The installation of guardrail nets is a cost-effective and advisable method for protecting personnel working on scaffolding or roofs from falling, and they can also be used as fall protection on flat roofs. 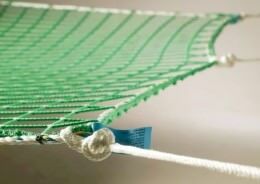 Unlike fall safety nets, guardrail nets function preventively as fall protection along the edge. The special nets are mounted on roof safety scaffolds or standard facade scaffolding – which is why they are often called “roof safety nets” or “scaffolding nets”. They must thereby completely enclose the different scaffolding levels, i.e. from one toeboard to the next. 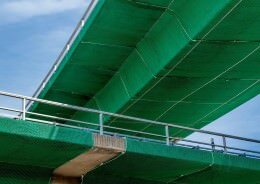 Requirements for guardrail nets are laid down in the European Standard EN 1263-1 and the German Employers’ Liability Insurance Association for the Building Trade (Bau-BG) regulation no. 179. Besides a maximum mesh size of 100 millimeters and UV and weather-resistance, the energy absorption capacity of the fabric is of course decisive. The guardrail nets that we offer fulfil these provisions and even exceed the required minimum energy absorption in a new condition. Thanks to this safety margin, our nets offer the greatest possible safety when working on scaffolding. Thanks to the installation of a scaffolding net, personnel can fully concentrate on their construction work without worrying about their own safety. In addition, a guardrail net protects people walking past the scaffolding from falling construction waste. 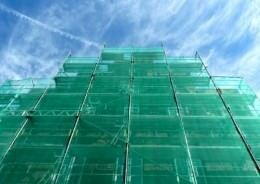 Safetynet365 offers a large number of guardrail nets in standard sizes for scaffolding structures. If you can’t find the right size among them, we’ll gladly produce a custom-made guardrail net for you. Regarding mesh size, you can choose between 45, 60 and 100 millimeters. We’re happy to support you with advice on purchasing a scaffolding net.